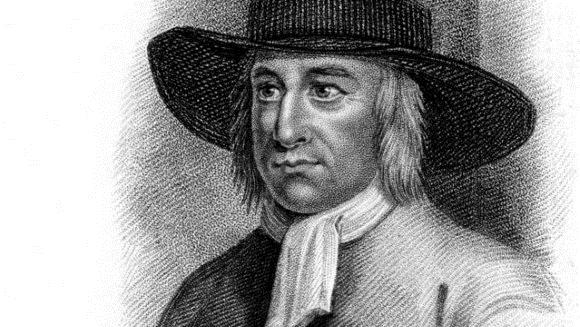 George Fox’s comment about walking ‘cheerfully over the world, answering that of God in every one’ has become a core belief of the Society of Friends (or Quakers) which he founded. The quotation comes from a letter written from prison in Launceston in 1656 during the reign of Cromwell. Fox was imprisoned several times, for blasphemy, for refusal to fight against the return of the monarchy, for refusal to take up arms for any reason , for refusal to swear oaths , for refusing to acknowledge titles (because all people are equal), or for ‘unauthorised’ worship. His uncompromising stance was seen as subversive by the autirities. So the ministers of the spirit must minister to the spirit that is in prison, which hath been in captivity in every one; that with the spirit of Christ people may be led out of captivity up to God, the Father of spirits, to serve him, and have unity with him, with the scriptures, and one with another. This is the word of the Lord God to you all, a charge to you all in the presence of the living God; be patterns, be examples in all countries, places, islands, nations, wherever you come; that your life and conduct may preach among all sorts of people, and to them. Then you will come to walk cheerfully over the world, answering that of God in every one; whereby in them ye may be a blessing, and make the witness of God in them to bless you: then to the Lord God you shall be a sweet savour, and a blessing.